The Deeley Group’s ‘model of brownfield regeneration’ has been shortlisted for a major property award. 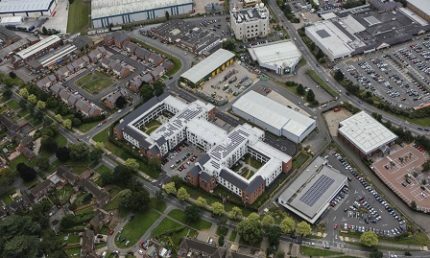 The company’s redevelopment of the Queensway area of Leamington – which has seen the creation of homes, retail and employment space on a redundant industrial site – has been shortlisted in the regeneration project of the year at the Insider Property Awards West Midlands. The development, described by local MP Chris White as a ‘model of brownfield regeneration’, includes housing schemes with Orbit Homes and Waterloo Housing Group as well as a new Aldi supermarket and Travis Perkins. The awards ceremony will take place on Thursday, November 19. 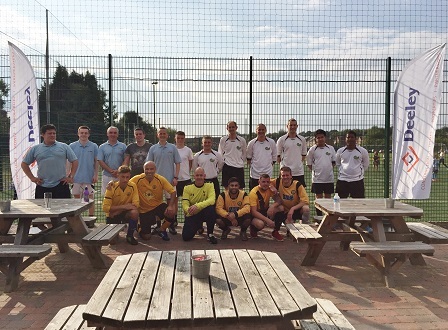 Deeley Construction staff swapped the building site for the football pitch to raise money for charity. The firm staged a five-a-side tournament match at St Finbarrs to help raise money for the Belgrade Theatre’s ‘Theatre in Education’ fund. Deeley Construction’s side was joined by teams from BPS, Robothams Architects and Orbit Homes with BPS taking the overall crown. The competition, which was organised by Edward Hudson, business development co-ordinator at Deeley Construction, raised a further £200 for the charity. Edward said: “We had already contributed £2,500 for the appeal, which is working to guarantee funding for the group for the next three years, so we’re really pleased with the progress we’ve made so far. 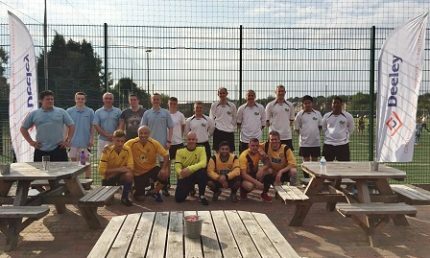 “The football match was a great way to get everyone involved and raise further funds and awareness of the charity, which is a very worthwhile cause. “All that said, there was still an element of friendly competition and our congratulations go to BPS for their success on the day! Housing tops the political agenda, with both party leaders touting their policies to solve the shortage. And after decades of decline, are SME housebuilders recovering just in time to help meet this demand? 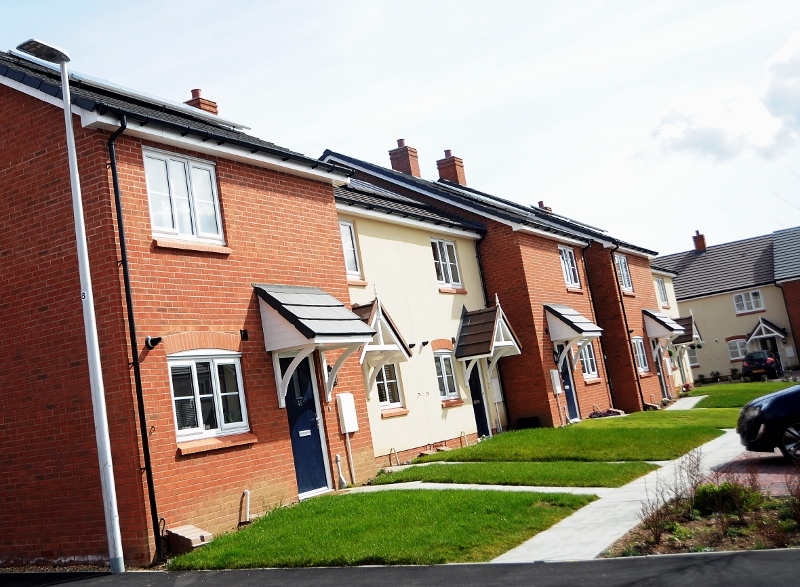 Read the full article here to see Peter Deeley’s views on the housing agenda. The Deeley Group, based in Coventry, has been building relationships as well as homes and public and commercial properties for almost 80 years. The company was formed by bricklayer George Deeley in 1936 and the business, which is still run by George’s son Peter, has gone from strength to strength, now occupying purpose-built premises at the Coventry Business Park in the city. 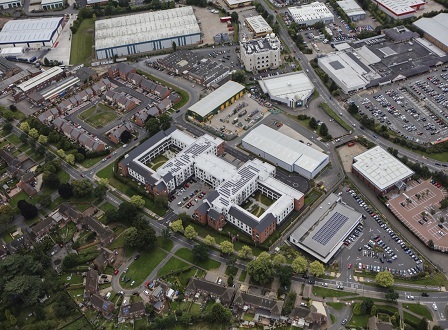 Its development arm – Deeley Properties – continues to thrive and has helped to regenerate sites across the region, bringing employment, retail, leisure space and homes to all four corners of Coventry and Warwickshire and beyond. Deeley Construction, the company’s contracting division, continues to carry out work on behalf of a range of clients on a host of projects including at HORIBA-MIRA, Warwickshire College, the University of Warwick, Coventry University and on a series of retail parks for LondonMetric Properties. 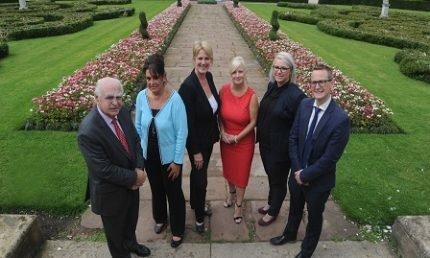 But the Deeley Group’s foundations are laid on its commitment to its community and that is part of the thinking behind the decision to become a corporate member of the Coventry and Warwickshire Chamber of Commerce. 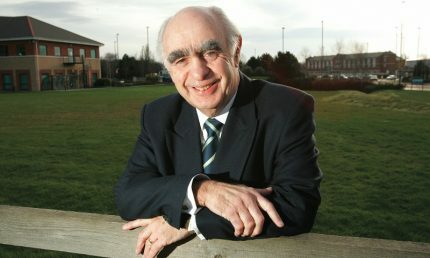 “The Chamber has the economic wellbeing of Coventry and Warwickshire at its heart,” said Peter Deeley, “and we are fully behind that. Our roots are in this area and we want to support the Chamber every step of the way in bringing further prosperity to the region. To that end, the company is a big supporter of organisations such as the Heart of England Community Foundation, the Grace Research Foundation and Theatre In Education (a programme led by Belgrade Theatre) which supports youngsters in Coventry and Warwickshire to develop through drama. It’s the sign of a company that wants to play its part in more ways than one. 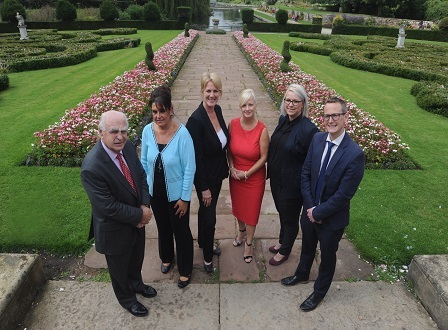 Pictured (left to right): Peter Deeley (Deeley Group), Elizabeth Belhadj (Coventry Chemicals), Louise Bennett, Hazel Pilling (both Chamber), Johanne Thomas (RadioStation Rugby), Edward Hudson (Deeley Group). A new community of older people in Leamington Spa is celebrating after they marked the official opening of their new homes. Queensway Court, an independent living with care scheme for people aged over 55, was opened on Thursday 1 October by the Chairman of Warwick District Council, Cllr Michael Doody, and Chair of Orbit Group Baroness Tessa Blackstone. Residents of Queensway Court, developed by Orbit Homes and managed by Orbit Independent Living, gathered in its landscaped gardens to watch Cllr Doody and Baroness Blackstone officially open the scheme. 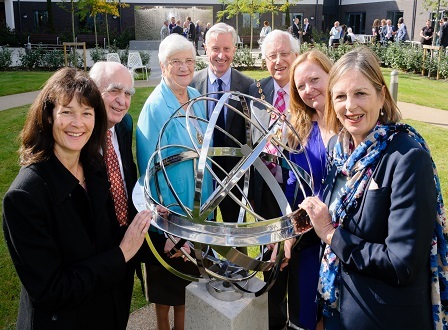 To mark the opening, a commemorative sundial, engraved with a quote from Shakespeare’s A Midsummer’s Night Dream was unveiled. To reflect the inclusiveness of Queensway Court’s motto ‘making everyone welcome’, the quote says: “Love looks not with the eyes, but with the mind, and therefore is wing’d cupid painted blind”. Baroness Tessa Blackstone said: “Queensway Court offers people a real alternative to residential care schemes; providing an important contribution to the development of independent living across Leamington Spa and the Warwick district. Formerly derelict land on an industrial site, Orbit has regenerated the area at Queensway Court into 178 one and two bedroom apartments and penthouses. Offering a mix of shared ownership and rented homes, Queensway Court provides improved aspirational living for customers no matter what their age. Designed by the award-winning PRP Architects and built in partnership with Deeley Construction, Queensway Court has recently been shortlisted for Development of the Year in the Chartered Institute of Housing Midlands Awards. 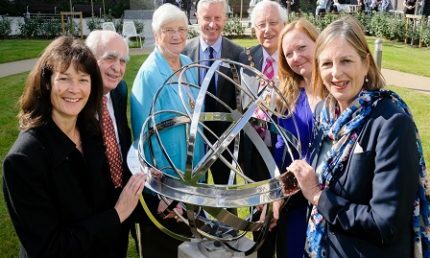 Christine Addison, HCA; Peter Deeley, Deeley; Lady Sheila Doody, wife to Cllr Doody; Paul Tennant, Chief Executive Orbit Group; Cllr Michael Doody; Anne-Marie Nicholson, PRP Architects; and Baroness Blackstone. We are an industry that, since the war, has suffered due to having to live through the cycles of boom and bust – we are currently entering a period of new positive activity due to the returning confidence to the market. 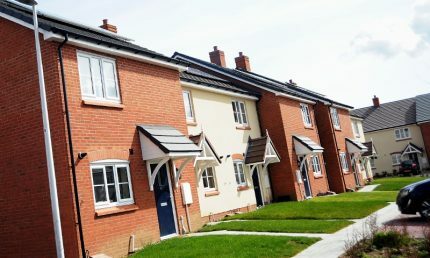 I think we saw the green shoots start last year and this recovery has continued with the Construction Products Association (CPA) forecasting growth in output in the sector by 5.3 per cent in 2015. Our spread of activities continue into housing, commercial, educational facilities, student accommodation, retail and leisure where we are finding the ongoing expansion of all of these sectors. To achieve these results of this increased workload we need to ensure that we continue to meet our clients’ aspirations in terms of time, cost and quality. We continue to train where we can, but our industry does need to understand that we have an increased requirement of more training to be completed throughout the industry so to meet this growing demand. Our clients still require us to cover all of their activities and as part of our service to our clients we have been building in Cambridge, Bedford, Hertford, Bristol, Evesham and Dudley as well as our immediate local area of Coventry and Warwickshire. The issue that affects all of our developments is that of obtaining a planning approval for a project, a process that is certainly taking longer than anyone can envisage. 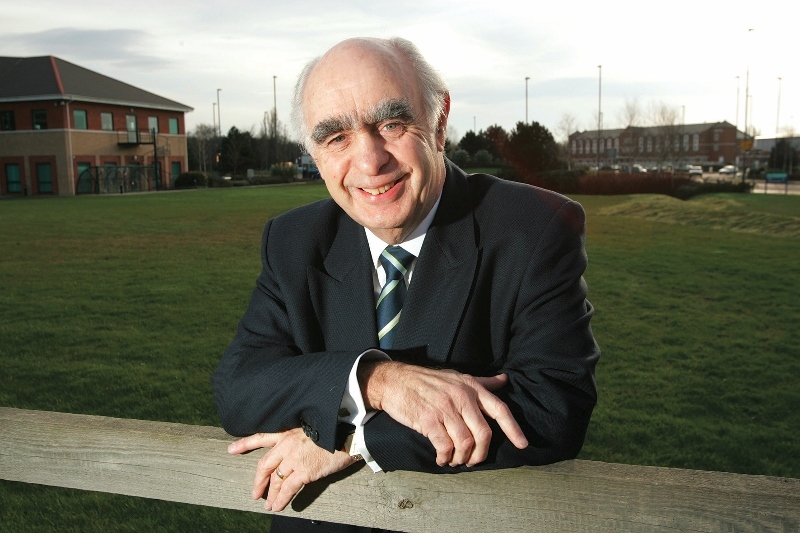 I sit on the Planning Group of CW LEP where we have been able to sign the authorities in our region up to a new planning protocol so providing a clear commitment to improving the current position – let us hope improvements can be made. We continue to engage with all of our clients (an early start is sometimes required) as we develop our working relationships with them so to provide a completed project that is required to work for them. 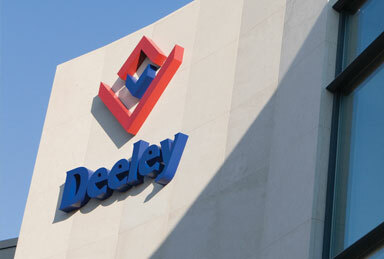 Our continued success is testament to all at Deeley and I thank them for their commitment and effort.